Best possible therapy, physically and emotionally. Having had two knee replacements within a year, I owe a great deal of thanks to Great Northern Rehab for my wonderful recoveries. They provided the best possible therapy, physically and emotionally. 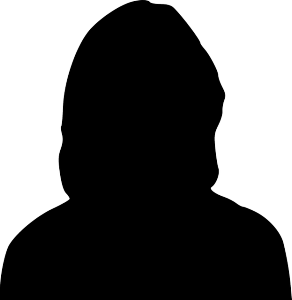 They provide a warm and caring environment, which is important in the healing process. I am now pain free due to their commitment and therapy. 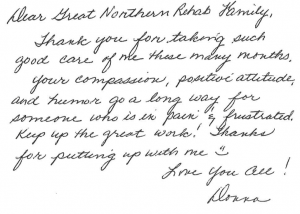 We should be very proud to have Great Northern Rehab in our community. I appreciate all of Shawn’s help! Thanks much! 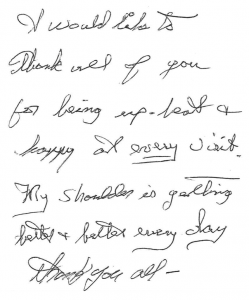 … to thank you for helping me rehab the knee. This winter I downhill skied, X country and snow shoed. The custom knee brace is perfect. Thanks for helping to keep me active. I’m now hiking + getting ready for the Green Bay Half Marathon. Yay!! Thank you for taking such good care of me these many months. Your compassion, positive attitude and humor go a long way for someone who is in pain & frustrated. Thank you so very much for your excellent care. I appreciate your professionalism and knowledge. You are a good listener and an exceptional physical therapist. 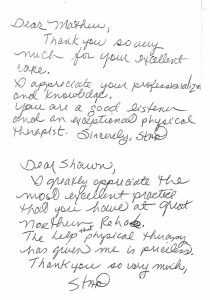 I greatly appreciate the most excellent practice that you have at Great Northern Rehab. The help that physical therapy has given me is priceless. I would like to thank all of you for being upbeat and happy at every visit. My shoulder is getting better and better every day. It’s great to be pain free and able to move the shoulder. 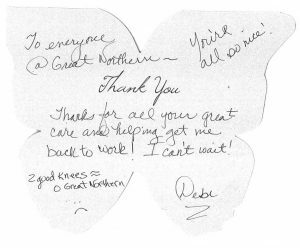 To everyone at Great Northern, Thanks for all your great care and helping get me back to work! I can’t wait! You’re all so nice!